Increasing in popular appeal since its inception in 1992, Evenings on Campus has become a regular summer fixture in Malta’s cultural calendar. 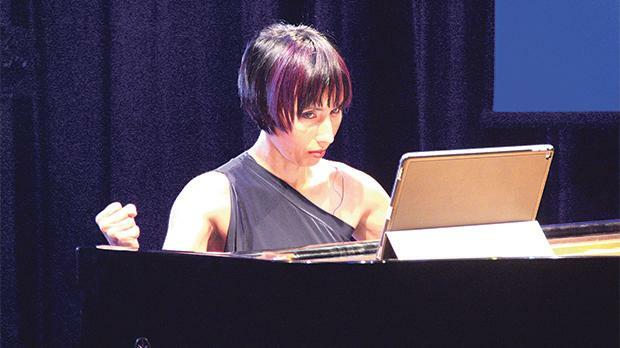 The opening evening this summer was entrusted to pianist Tricia Dawn Williams, leading pianist in Malta in the contemporary and avant garde genres. Dubbed Transition it was held at the Old University Theatre in Valletta. 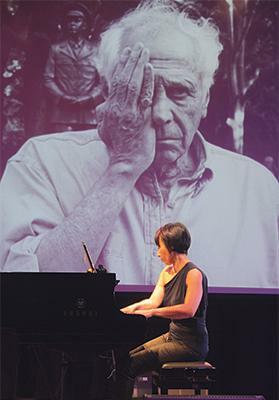 As with all the recitals she presents, Williams prepares works which are either new to local audiences or as a sort of reminder – a work which she has performed before and which had left a striking impression and effect. Her dedication to her art is there for all to see and feel, combining a strong personality and sensitivity. An example of the former case was the first piece, Atau Tanaka’s Suspensions. Originally composed in 2009, it was reworked this year “to wear a widely available wearable interface, the Thalmic Labs Mzo, and in this form was given its world premiere on the evening. It turned out to be a pretty amazing work combining an EMG or Electromzogram signals with other familiar use of the hands, but when the score calls for it, the pianist with superb muscular control and thanks to a particular device manages to influence the sound of the piano with abrupt movements bring the music to a sudden stop, as if suspended in mid-air. This work, as did many of the other works in the programme, explored and stretched beyond anything one had ever heard as to the tonal possibilities of the instrument. The work was made possible thanks to the gener-ous support of the European Research Council under the EU Seventh Framework Programme. Composer Ruben Zahra, who often collaborates with Williams, introduced every piece she performed. He was also in charge of the electronic aspect of the performance, projecting on the screen in the background images, designs and signals which were synchronised with the music. Zahra composed the music of Pounding in 2007 but produced the video this year. This is the fruit of his experiments with photography and video editing. The work could be very tense at times as the pianist, with her playing, seemed to be inflicting scares on the very expressive face of a female model. There is a lot of wrapping and unwrapping of bandages, especially of the head. The presence of scars hits one but the continued emergence of the face without any sign of damage arejuxtaposed with contrasting sections of melodic and purely rhythmic ones. This powerful work was followed by the last of Henry Cowell’s Three Irish Legends, composed in 1920 and thus the oldest work in the programme. The Voice of Lir is beautiful and haunting, yet could be pretty relentless too. There is a strong cosmic and epic quality to it and it was performed with determined zest and energy. In Piano Counterpoint for piano and tape, the audience was entertained to an arrangement made in 2011 by Vincent Corver for solo piano and four pre-recorded piano parts. It is based on a work, Piano Store, composed in 1973 by Steve Reich originally for all pianos in a piano store but eventually scored for six upright pianos. The performance highlighted the fascinating sonic differences from the original via amplification and solo part in which some of the melodic phrases are an octave higher which enriches the sound. Equally powerful and very stark, a study in loneliness and despair, obsessive behaviour and the isolation of an elderly person in a metropolitan context was Transit for piano and video dating from 2009 and composed by Michel van der Aa. I had seen and heard this work in another recital by Williams whose virtuoso qualities in the relentless portrayal of manic obsessive behaviour highlight a very common problem in this modern world of ours in which utter isolation and loneliness exist side by side with crowded, uncaringly busy urban life. It sends a very powerful message. The exploratory nature of George Crumb’s Makrokosmos Vol 2, Part 2, for amplified piano, taxes the piano’s resources to its limits. The hands do use the keyboard but the strings are plucked by both fingertips and fingernails. A number of glissandi and special pedal work, traditional colours, basic technique and other effects create an extremely rich sound with a very wide dynamic range. All very finely handled and projected by the pianist who deserved the very appreciative response of the audience.